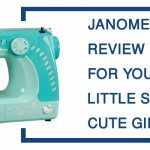 The Janome 2212 is an for excellent entry level machine and the perfect follow-up to the Janome 11706 Hello Kitty beginner’s model. The controls on this machine are mostly mechanical, and it is not heavily loaded with electronics. This allows the beginning sewer to experience adjusting tension and many other basic functions of the machine. This way when they move up to a more sophisticated machine with automatic systems in place, they will understand exactly how they work and would be able to make better choices as they advance in their capabilities. This machine is designed for the beginner, but it is also an excellent second machine to take along with you. Even though this is considered a basic machine, it still has a number of options available. 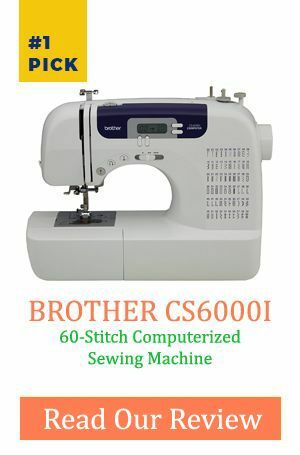 It features 12 basic stitches, one four-step buttonhole function, and a push-pull bobbin winder. It has a drop feed and easy to manipulate stitch selection dial. 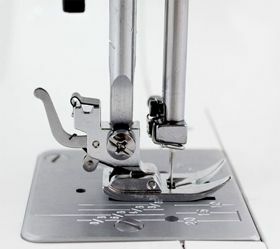 It has an extra high presser foot lift that will allow you to sew multiple layers of fabric easily. This machine is intuitive and easy to use for the beginner sewer. The advanced seamstress will find this machine refreshingly simple. It comes with a snap on presser feet, so you don’t need to use a screwdriver and worrying about aligning it properly. It has a vertical oscillating hook bobbin that is easy to load and put into place. The machine comes with a zigzag foot, sliding buttonhole foot, and blind hem foot. You can expand the capabilities of this machine and with a number of options that are available, depending on the type of work that you plan to do with the machine. For instance, the machine comes with a ¼ inch seam foot, gathering foot, rolled hem foot, and darning foot. 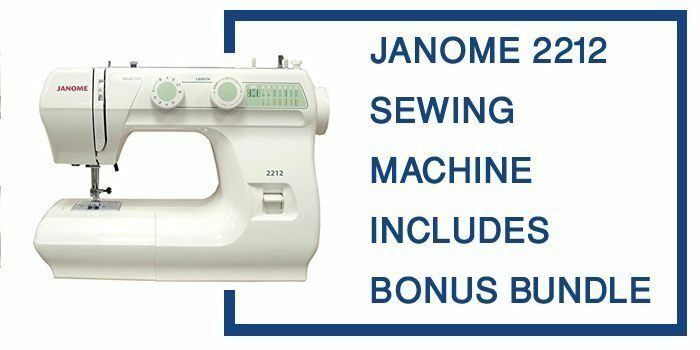 This machine may be a beginner machine, but the Janome 2212 is still made with the same quality and durability as more expensive models. It is made with heavy plastic casing and durable metal parts that will not wear out. The dials are made so that they will not wear out under normal use, and it is not heavy with electronics. Comes with an easy reverse button. Q. Can this machine do embroidery? A. This machine was not designed for embroidery and does not have a way to attach hoops. It is possible to do some basics with this machine by hand, but this is not the primary purpose of the embroidery machine. Q. Can the machine do the quilting? A. 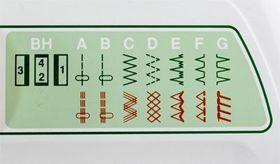 Although this machine does not have a large variety of stitches designed for quilting, you can do some basic quilting functions with this machine. An optimal quilting attachment kit is available. It is enough to get you started. Q. Can this machine handle tight spaces? A. The machine is designed with a table that allows part of it to be removed, converting it into a free arm machine. 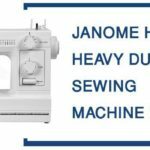 In the final verdict, the Janome 2212 is a great basic machine for the beginner sewer or someone who wants a portable machine that will do the basics. 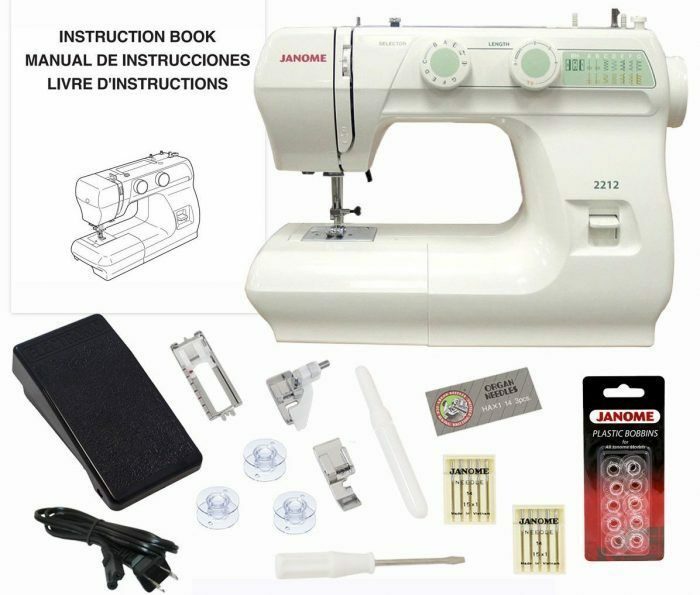 It is tough and durable, like other machines made by Janome and is backed by the same commitment to quality. This machine is great for the beginner because it has mechanical functions that will allow the ability to learn how they work before moving on to a machine that has more automatic features. This is a great machine for the person who only sews occasionally and limits their sewing to the basics.